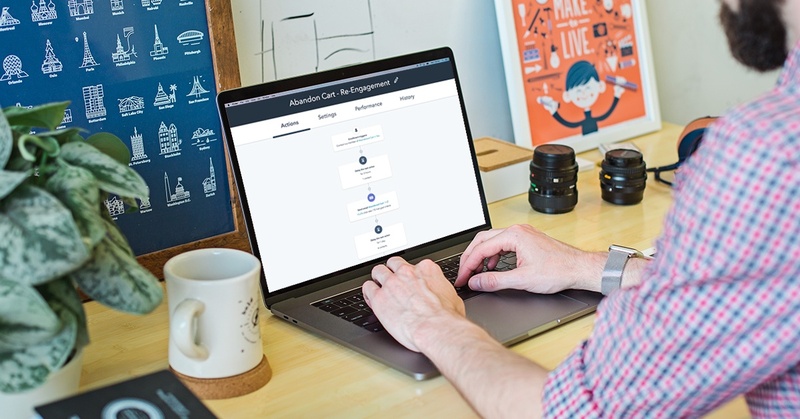 We've outlined the steps below to help you craft the perfect HubSpot abandoned cart workflow. HubSpot reports that an average of 73.9% carts remain un-purchased. If you're using HubSpot and want to get started, all you'll need is five minutes and an eCommerce extension we created called HubShop.ly. Have you ever walked into a room and asked yourself, “What did I come in here for again?” You’re not alone. One minute you’re shopping for a baseball jersey online, the next minute you’re scrolling through your Twitter feed. Before you know it, it’s time for bed and that lonely jersey is still sitting in your cart. HubShop.ly is an extension to integrate HubSpot with BigCommerce, Magento and Shopify. With HubShop.ly, you can automatically sync your eCommerce customer and order data with your HubSpot account. 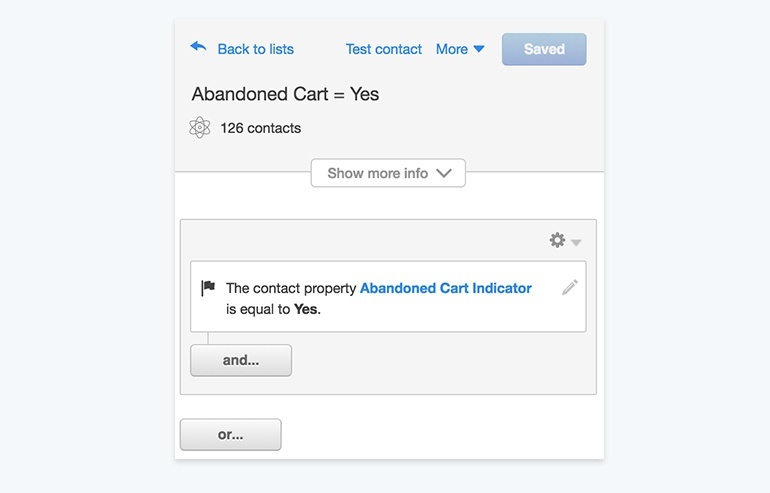 With HubShop.ly, you can capture cart abandonments in a HubSpot smart list. From there, you can recover these carts with automated and fully customizable email workflows. Cart recovery emails include product images and session restore links, allowing customers to revisit pre-filled shopping carts with just one click. HubShop.ly is easy to install and can help you cash in on potentially lost revenue. Among other benefits, HubShop.ly clients have experienced an 18% increase in overall revenue, a 21% decrease in abandoned carts and a 10% increase in repeat purchases. Overall, it is an integration that can significantly improve abandoned cart email strategy and help convert website visitors into customers. Although cart abandonment varies by industry, HubSpot reports that an average of 73.9% carts remain un-purchased. The good news? Abandoned cart workflows present a great opportunity to recover potential lost sales. If you want to get started, we've outlined the steps below to help you craft the perfect abandoned cart with HubSpot. All you'll need is five minutes and an eCommerce extension we created called HubShop.ly. To create the perfect abandoned cart workflow, you first need to make sure that your HubSpot account integrates with your eCommerce platform. This blog focuses on using HubShop.ly with BigCommerce, Magento and Shopify. Start by creating a list for your contacts who do not have an item in their cart. Let’s call the list Abandoned Cart = No. Set your criteria as Contact Property -> Abandoned Cart Indicator -> is equal to -> No. Next, you'll want to create a list for any contact who has left an item in his/her cart. Let’s call this list Abandoned Cart = Yes. 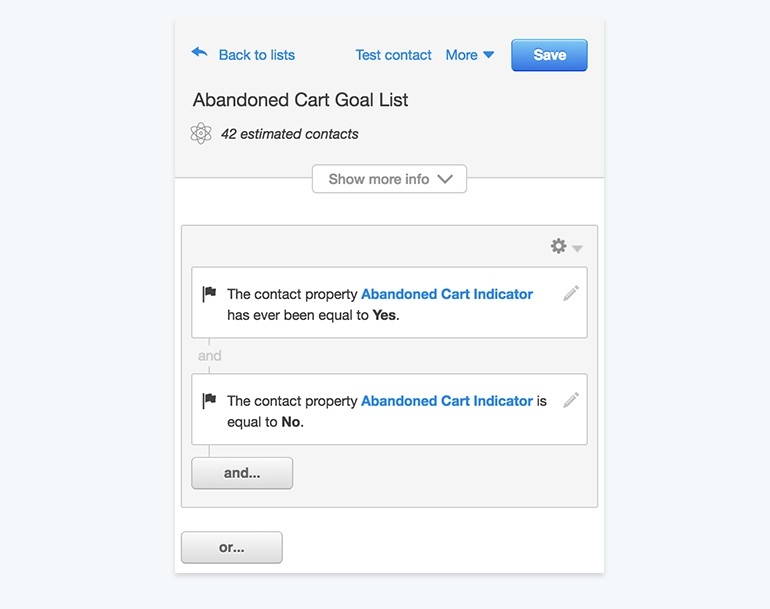 Set your criteria as Contact Property -> Abandoned Cart Indicator -> is equal to -> Yes. Finally, create a goal list for your workflow. Let’s call this list name Abandoned Cart Goal List. Set your criteria as Contact Property -> Abandoned Cart Indicator -> has ever been equal to -> Yes. Create another requirement and set your criteria as Contact Property -> Abandoned Cart Indicator -> is equal to -> No. Nice job! Now let’s move onto the next phase of this project. Emails are the most important part of your workflow. Make sure they’re enticing enough to motivate your users to revisit their shopping carts and complete their purchases. We recommend having 4 emails in total for your workflow. This is the easy part. You’ve already done the heavy lifting with the emails, now you just need to get these bad boys rolling. As I mentioned above, you’ll have 4 emails you need to send out (maybe less depending on whether or not the user makes a purchase at some point throughout the workflow). When active, this workflow will enroll contacts that join the list Cart: Abandoned Cart = Yes. Delay the next action for 1 hour. Send them an email Abandoned Cart – Email #1. Delay the next action for 1 day. Send them an email Abandoned Cart – Email #2. Delay the next action for 20 hours. Send them an email Abandoned Cart – Email #3. Delay the next action for 3 days. Send them an email Abandoned Cart – Email #4. End the workflow and make sure the goal list is set to Cart: Lifetime Carts Saved. In addition to the statistics mentioned above, there are many reasons why consumers abandon their carts. Maybe they’re looking to compare your price with a competitor’s price, maybe the consumer is uncertain about your store since he/she has never purchased from you before or maybe they aren’t quite ready to purchase. Whatever the reason is, by following the HubSpot abandoned cart workflow above you’ll be sure to start capturing some of these potential lost sales! Want to take HubShop.ly for a spin? Just click the link below to choose your platform and get started.